Warm, black sand beaches offer a haven for sunbathers and perfect setting for brilliant coastal sunrises and sunsets. Waterfalls plunge into emerald cold pools, then ease back into clean rivers, perfect for swimming and Sunday-like relaxing, everyday. ​A boiling lake unique to the world and deep in Dominica's mountains, challenges hikers, while natural hot springs call to sooth the soul and weary muscles. ​Supporting 365 rivers and a multitude of waterfalls the environment is always fresh, the climate spring-like; the sun is either shining or it is raining. Rainbows are plentiful ...and experiences are bountiful. 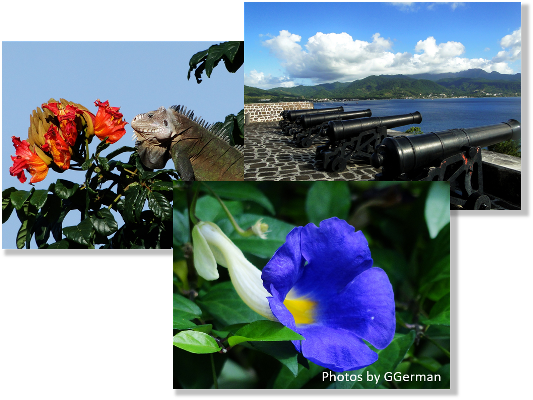 Known as the Nature Isle of the Caribbean, Dominica isn’t the typical resort destination like other Caribbean islands. Dominica (not to be confused with the Dominican Republic) is not over-commercialized or overrun with tourists. 29 miles long and 14 miles wide, Dominica’s rain forest environment consists of lush green and rugged mountains, deep gorges, vegetation and sea views from practically every location on the island. is Dominica, the Nature Isle.